The SNHU baseball team, competing in the College World Series, is getting some inspiration from their biggest fan. A New Hampshire baseball team competing in the College World Series is getting some inspiration from their biggest fan. 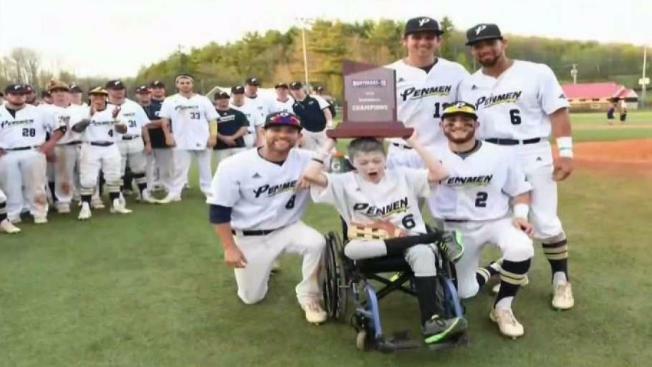 Ian Price bet the Southern New Hampshire University baseball players that if he could get out of his wheelchair and walk across a parking lot, then they would have to win their game. “He’s taught me so much about myself and my work ethic, as a person and as an athlete,” said SNHU Baseball Player Ivon Clough. The 15-year-old is with the Penmen in North Carolina as they compete in the Division II College World Series. Price held up his end of the bargain, walking the farthest he ever has, since getting diagnosed with a brain tumor about six years ago. “If he could take that walk for us, I knew we could get a win for him,” said teammate Mitchell Powers. NBC10 Boston caught up with Price via FaceTime on Monday. “Do you need to get my good side,” the teen said jokingly. In 2012, the quick-witted Derry boy was diagnosed with a brain tumor. A year later, he became a member of the squad through Team Impact, a nonprofit that pairs kids with life-threatening illnesses with college sports teams. His mom tells us he’s been wheelchair bound until just recently. “The other day he walked 45 steps with his physical therapist, unassisted, so we knew he was gearing up for this,” Nancy Price said. She says the parking lot bet was the farthest her son had walked since being diagnosed. For Price's teammates, who typically have to help him stand up, it was a moment they weren’t sure they’d ever see. “I mean, it’s just unbelievable,” Clough said. “He’s amazing, he’s an amazing kid,” said another teammate Jake Walkinshaw. So, as Price reached for the finish line all on his own, the Penmen knew they had no other choice than to hold up their end of the bargain. “If he could take that walk for us I knew we could get a win for him,” Powers said. The Penmen play again on Wednesday. Price says his next challenge will be to someday run the bases.